The cross-platform market is expected to touch the figure of $7.9 billion by 2019 because both Android and iOS have substantial user base. While Android is leading the race with 75% users on board, iOS is not far behind too. iOS runs on 21% of mobile devices right now. For this reason, it is very important for startups and enterprise to build their apps for both the platforms to completely reach their target audience. Building the app on different platforms has brought its own challenges. These challenges include the high costs and complex nature of app development process, which requires expert resources for different platforms. Flutter, however, is one of the most used cross platform app development solution just behind React Native. However, unlike React Native, it brings native-like performance and ease of development on the table. Not only does Flutter reduces the production costs of the app with its amazing features, but also lowers the complexity level of app development, at the same time, fastens the entire app development process. Although Flutter seems to be the future of app development with its continuous development and over the top features, there are a few limitations of Flutter which are yet to be improved. 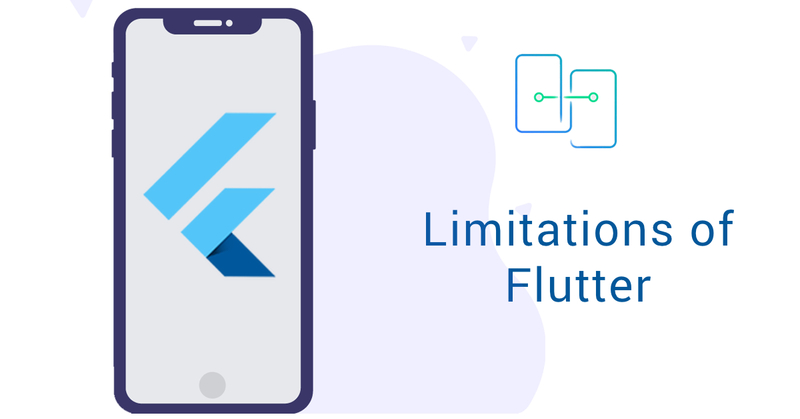 Here, we’re counting some of the most common limitations of Flutter which will help you in deciding whether you should opt of Flutter or not. Flutter is not too old unlike its contemporaries and lacks the presence of third-party libraries. Although, it gives an amazing UI package, yet the requirement of third-party libraries for extensive development is still awaited. For example, it’s rather easy to find libraries for React Native than Flutter. Also, some widgets in Flutter are specific to one platform. This may make some developers move away from Flutter if what they need is not available for their target platform. However, Google is putting a lot of efforts to bring developers to Dart and ultimately to Flutter. They keep their documentation up-to-date too. Flutter is fairly new in the market. Although, it enjoys great attention from the community of tech enthusiasts, yet proper continuous support is missing, which would come with time. Hence, the only support a developer can get is from the community. We’re not complaining though. The community is welcoming and friendly in nature. They also expect first timers to send them pull-requests. They have a dedicated guide to receive contribution which every developer should read before starting. Flutter has launched its version 1.0 just a few months back, and the best of it is yet to come with time. Developers around the world are making amazing apps with Flutter. However, there are some cases where Flutter falls short as compared to Native apps. For example, complex games are yet to be made in Flutter. Things like 3D modeling, Unity integration, game engines are expected from the community at large. Many mobile ad platforms do not support Flutter too. Although this seems to be a passing phase. The amount of development that has been done on Flutter clearly tells that all these things will happen very quickly. Flutter, which is still in its 1.0 version has already managed to garner a great sense of attention among the developers’ community, startups, and enterprises. With its high-quality app development for Android, and iOS, providing a very good UI package along with its handy widgets, Flutter is surely here to stay. While it has a few above limitations, Google and the community is already working on overcoming its past limitations such as large file size, which eventually got decreased by 2 MB with the latest modifications. With Firebase integration, developers can make cross platform mobile apps along with the complete backend very quickly. Many developers have already made templates for particular use-cases like ecommerce, social network, chat apps etc which other developers can use to quickly build apps. To summarise, if you’re looking to build 3D games, VR/AR apps, or very complex dynamic apps in Flutter, we’d suggest you to wait. However, if you want to build an ecommerce app for your store, business apps with specific workflows, chat apps or social media apps, we’d ask you to build them with full confidence as Flutter will not disappoint you for these use-cases. At CitrusLeaf, we have been developing apps on Flutter since its inception. We also released an open source Hacker News client on Flutter and we’re currently working on some complex projects to expand Flutter to its limits. If you too are looking for an app with a beautiful UI experience, along with high performance then feel free to write us at hello@citrusleaf.in or contact us for reliable Flutter App Development Services.